Laura Hillenbrand, author of the book “Unbroken,” is a writer of great taste and enormous talent. She told the true, fully-human story of Louis Zamperini in a way that put his horrific experiences in World War II into the context of an extraordinary life. My question: would director Angelina Jolie turn that same life into a torture-filled cringe-fest focused on the Japanese POW camps of World War II? I needn’t have worried. 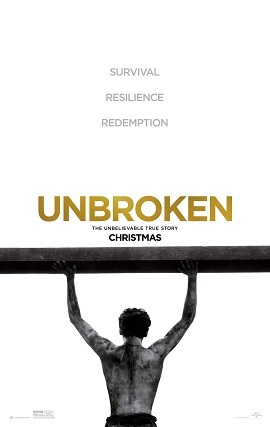 Although nearly half of this 137-minute movie takes place in the camps, Jolie provides enough of the backstory to make Zamperini’s mental and physical toughness understandable — and she offers enough balance in the POW experience to enable us to see its brutality without becoming over-burdened by it. The movie is sometimes not easy to watch but it’s always bearable. Although we begin with Zamperini (Jack O’Connell) as a bombardier in the war, Jolie cuts back and forth to his days as a petty thief in California and to his record-setting performance in the 1936 Olympics to give us a fuller sense of his life.